Or should that be well smart Scania?! This comes from Neil from Northampton, or should I say Neil with the green and yellow trucks, or should I just say Neil Rogers. Luckily at work we deal with EM Rogers Transport, usually giving them exports to France or Italy or them giving us Italian imports. Every now and then Neil emails over a real gem (to be honest they are all real gems!) 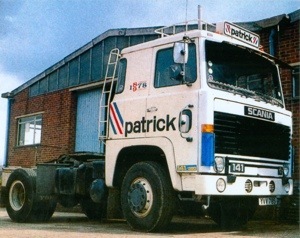 like this gorgeously hard worked Patrick Scania 141. Impressive spec, it’s LHD, must be the euro spec cab as its got the little window and mirror on the passenger door, roof tack and ladder, Scandinavian 4 spot bumper, little fuel tank perhaps to be filled from the trailer belly tank?? Anyway forget all that there are a few stickers on the truck too. What’s the 1978/1878 sticker behind the door and what are all the stickers on the windscreen under the window wipers?? Great photo, thank you Neil and thank you for letting me share it on here. One last thing for you truck spotters out there, I remember Neil saying that the real rare unphotographed truck on the fleet was a Renault Magnum wagon and drag. Has anyone got a photo of the rare French beast??! This entry was posted in Drivers Photos, Golden Oldies, Photos, Scania by truckbloguk. Bookmark the permalink.